Let’s start with something simple first and work our way through. Here is a rather simplistic first version of the “Hello World” plugin that we’ll be expanding and and improving. Here, I’m checking for the existence of my say_hello() function. If my plugin is deactivated, nothing will be printed out. If it is activated, and the function available, it will be called, and the output of it will appear in my sidebar. If I won’t check for the existence of the function, than chances are, I’ll get a nasty error message in my sidebar when the plugin is disabled. Obviously, I don’t want that. So, what happens here? 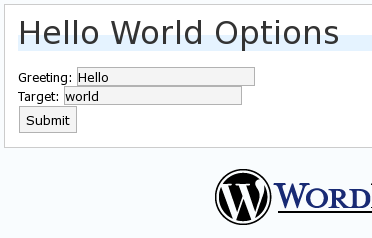 First of all, I modified my say_hello() function to use two WordPress options – ‘hello_greeting‘, which I can use to change the greeting text to ‘hi’, ‘good morning’, or whatever I feel like, and ‘hello_target‘, which I can use to change ‘world’ to ‘me’, ‘admin’, universe’, or, again, whatever I feel like. Then, I added a couple of functions – set_hello_options() and unset_hello_options() . I use this to, obviously, add and remove my options to WordPress options table. And the last thing I added here is plugin activation and deactivation hooks. When my plugin is activated, options are added to WordPress database. When the plugin is deactivated, a cleanup is called and options are removed from the database. We saw how to do this before, in the automation with plugin post. Under the hood changes don’t affect the result – I can still see the “Hello world” in my sidebar after plugin deactivation-activation, which is needed to set up options right. So far so good. Now for the juicy stuff. How can we manage those plugin options of ours from within administration screens? The answer is simple. We’ll have to add a new screen to the Options area of the administration. We’ll need a sub-menu item (similar to ‘General’, ‘Writing’, and ‘Reading’ which are already there) under Options. That sub-menu item will point to our own options form, which will have our own logic and way of doing things. How do we add a menu or sub-menu item to WordPress administration interface? Let’s see what Codex has to say about it. A quick search here and there and … yup … we have it! Adding Administration Menus page tells us all we need to know and more. It covers all the grounds – main menu items, sub-items, has a sample plugin, and this and that. Now I don’t even know why I’m writing this article anymore – that’s how good that page is… But people always tell me that I never finish anything, so just to prove them wrong, I’m going to finish this post anyway. This might look a little confusing, but don’t let the looks of it set you off. Here is what happens. To modify WordPress administration menu, we have to hook to ‘admin_menu‘ action. Our plugin tells WordPress to call a function modify_menu() when the action ‘admin_menu‘ is executed. (You might want to pick a more unique name for a real life plugin, by the way) Our modify_menu() function can do all sorts of changes to the administration menu, but we need it to do only one – add a sub-menu to Options page. To add a sub-menu to Options page we are using the add_options_page() function. I separated parameters to one per line with a little comment to make it easier to read. First parameter is used for the page title. Nothing important, so you can put anything in here. The second parameter specifies how we want our sub-menu item to be named. This is what will appear in the menu. The third parameter specifies which user level access or capability a user must have to be able to access this menu item. WordPress will hide the menu automatically from users who don’t have rights to access it. Now, the fourth and fifth parameters specify the file and function to call when the menu item is selected by the user. These last two parameters give a lot of flexibility to how you want your plugin code organized. If you build something small and simple, like we are doing now, you probably would want to handle everything from a single file. Use __FILE__ as the name of the file for current file, and have a function that would handle all the administration stuff. If you have something more complex, you might want to have this Options screen stuff separated into a file of its own. Then you don’t have to specify the function – have all your logic in the file and that’s it. If you have something even more complex, you might want to use both the file and the function within it, to specify a precise place of where the options handling is happening. WordPress doesn’t limit you here in any way – it gives you the right to choose what’s the best approach for your task. This is one of those places that make WordPress so easy to appreciate. Back to our example. From the code above you can see that I created an empty function admin_hello_options() which will be called when the user selects Options->Hello world menu item. Because my function is empty at the moment, not much fun will happen. Let’s see a screenshot, should we. It’s all here – Options menu, Hello World sub-menu, an empty thing done by my empty function, and a standard WordPress footer. We are moving along just fine. Now for the final step of our journey. We need to integrate our plugin, which supports options just fine, with the nice WordPress interface which we managed to find our way in. Again, I’ll try to keep things as simple and small as possible here. WordPress uses Cascading Style Sheets (CSS) to control how things look. So, to make our options blend in nicely, all we need to do is to use the same CSS classes as WordPress does in other Options screens. That’s why we wrap everything into a DIV with class “wrap“. And that’s why we use the H2 for the heading. The logic of our options handling is pretty simple. If value were updated through the form, then save them in the database. Print the form to change the options in any case – whether they were just changed or not. That sounds like two functions and an IF statement. And that’s what we have in our function – a check for the submit button click, and two calls – one to update_hello_options() function, and another one to print_hello_form() function. Of course, you can skip all these functions and just through pieces together. But that’s not how I prefer it. It’s not the most beautiful thing that I’ve seen in my life, but it sure works. The default option values are there, and if I type in the new ones, and click “Submit” button, I get a nice message telling me that everything worked OK, and my web site’s sidebar shows the new values. All that remains now is a little beautification of the screen. I’ll leave it as exercise to you, since you probably will change the looks of it anyway. Just a hint – surround the Submit button with the paragraph of the “submit” class, and use table of class “optiontable” for the lining up of your option rows. There is also something about fieldsets there too, but as I said – that stuff is too easy to find on your own. (View HTML source from within your browser). In exactly the same way you can add screens to some other main menu items. Instead of add_options_page() call add_management_page() to add a screen under Manage, or add_theme_page() to the a screen under Presentation, or add_user_page() to add a screen under Users. This entry was posted on August 15, 2007 at 3:47 pm	and is filed under Documentation, Menu, Options, Plugins, WordPress. You can follow any responses to this entry through the RSS 2.0 feed. You can leave a response, or trackback from your own site. I was just looking for something like this, and then I saw it on my WP dashboard. Good Read Now I know where to look if I ever what to start learning how to make a WordPress plugin. Where can I vote for this posting? I would like to give it 100/100 points. The content in combination with the screenshots simply rock. Without them this would be another average posting. I was wondering whether there are websites that show coding veterans from the past (C64/Amiga/PC assembler ;)) how to do some basic WordPress Plugin coding. And here it is. Thanks for the article! Was looking for a simple guide like this. Leonid, IMHO is worth to mention the importance of wp_nonce_field/wp_nonce_url/check_admin_referer functions when saving options that depend on user input — it seems that many developers are not aware about CSRF vulnerabilities. Awesome tutorial – I used this as inspiration to hack up a new plugin based off of BM Custom Login that I like to call Super Custom Login Page (sufficiently cheesy). Basically I’m using Binary Moon’s hook for the style sheet, the template, and the CSS, and adding a bunch of extra PHP of my own. Between WPbits and the plugin reference on WordPress.org, I’ve managed to add a feature to allow you to customize the link and link title on the login page (so your site logo doesn’t link to wordpress.org). This was super simple and I managed to complete what’s done so far in a little over an hour. I plan to add the ability to customize the CSS from within WordPress’ admin area as well. However, I’m also a little concerned about security – if I’m going to release this, I want to lock it down to prevent accidents. Which brings me to my question: what functions should I use to “sanitize” my inputs? I’m sure there’s a “best practice” somewhere… I just haven’t found it yet. Nice. I’d love to see a post on how to add options to themes as well. I wasn’t going to bother with an Admin section of my plugin, but after copying reading your tutorial, it’s going to be pretty good. Wow – I have learned soooo much from working through this tutorial, great work man and much appreciated! However, I really want to learn more about how to secure this kind of plugin build. I have read through the comments and searched for info via Google and the WP site, but still havn’t worked out how to stop nasty people exploiting this kind of plugin – I simply don’t know enough about PHP and WP to do this. Maybe you could post a simple solution that we can all understand – it would be VERY much appreciated (and yes, I’ve asked for help in the WP forums, but no-one is helping me (and many new plugin developers) out! If you do anything like this (taking input from the outside world in a plugin), take the time to figure out and implement nonces as well. It’s worth it. Further the discussion on security implementations, I started a discussion thread over on the WordPress forum, which is starting to provide some valuable (and very relevant) info on securing a plugin with a build like in the example given. Absolutely invaluable tutorial. I was able to create my first plugin in an hour or so. Thanks for this excellent writeup! I am using your information in the development of a WordPress Plugin Framework in an attempt to create a common platform for developing WordPress plugins. I have provided a link below so that you may take a look at it and let me know what you think. This is a great article! Thanks for informing us; I was quite lost with how to make an options page until I read this. Thank you for the great tutorial. You laid out the basics in a nice easy way to understand. thank you, it helped me a lot, you just cshould update functions.. Excellent step by step tutorial! I was looking for something like this to build a plugin ASAP, but the codex docs I think, asume we know some stuff (not my case :P), so, quoting your text: “… Now I don’t even know why I’m writing this article anymore…”, I can only tell you that sometimes other points of view are needed! any update on this? that works with wp 2.7? You saved me a great deal of time developing my plugin’s administrative interface. Thank you! You are good in explaining in simple way. Thank you, I will modify my plugin htmlPad with option supports. You are good in explaining in simple way. I will modify my plugin htmlPad with option supports. Thanks a lot … Based on this tutorial today i made my plugin option page for Admin Panel. I want to write a simple plugin for my WordPress blog but I didn’t find any documentation for what I need. I want to have a settings/options page to save each user’s website URL (by user ID) on a separate admin menu page, but not on Profile page. I want to give each Logged In user the possibility to save and see the settings/options page with their individual options saved. Can you post on your website an example, please? Thanks a ton. Using this for a plugin on my site. Tried someone else’s tutorial and it failed, this one was great. Thanks again. I can’t believe that it’s May 2011 and your tutorial still work perfectly. Thanks..great info for wp plugins developer. Its June 14, 2012 and still article save me day or might be two. A perfect example of what I was looking.